It's freezing cold here and it's been a long week. Lots of ups and downs. This morning I decided to end the week on high note with a "sweet" surprise for my kids after school. Homemade chocolate chip cookies and hot chocolate. We don't have any food restrictions, but I have been trying to limit dairy in my diet. When I came across a hot chocolate recipe from Mel's Kitchen Cafe that suggested using chocolate almond milk I had to give it a try. I adapted the recipe to my liking and it's a winner!! No one here had any idea that I used chocolate almond milk in place of dairy milk. In a saucepan, add cocoa powder, sugar, salt, and water. Whisk together and stir constantly to prevent burning. Turn down the heat and simmer for 2 minutes. Add Chocolate Almond Milk and let simmer until hot, but not boiling. Serve immediately or transfer to a slow cooker. You can keep it on warm for several hours. Then top with whip cream (if you don't need to be dairy free), marshmallows, Piroutte chocolate wafers, sprinkles and enjoy! Cheers to Friday and sweet gestures towards the ones you love! 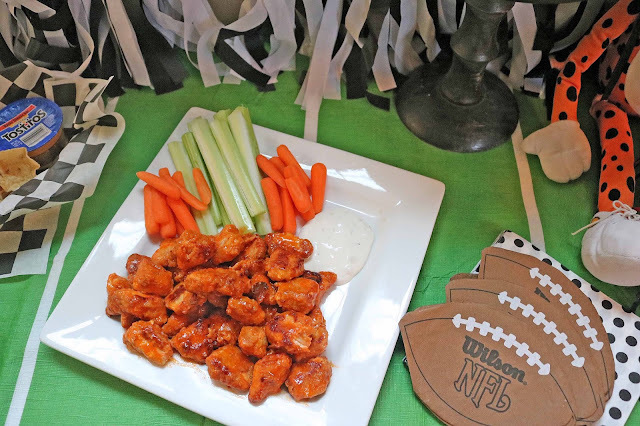 Whether you are there for the game, food, or commercials, I've got some easy and delicious ideas for you. Get your game face on and lets go!! First, the table decorations. 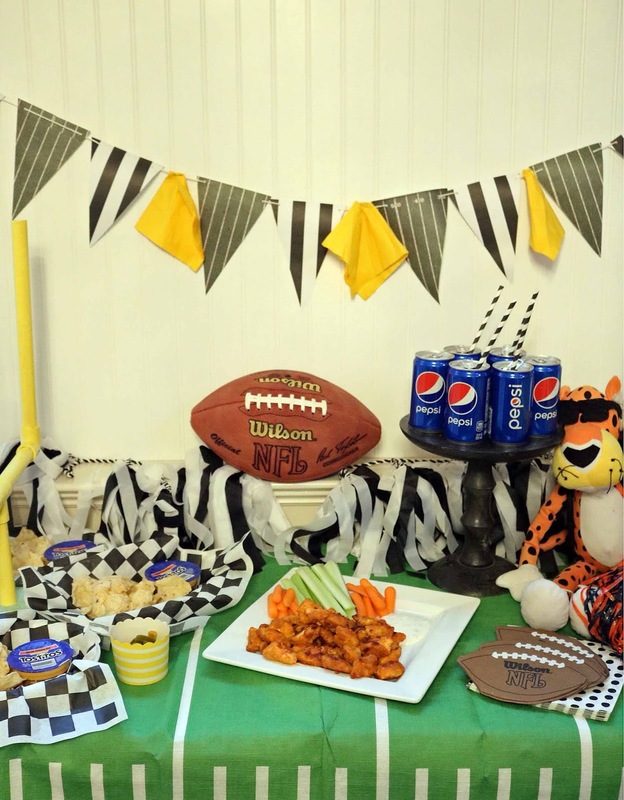 Here is how you can make a super easy and cheap football banner. I found the 12 x 12 football field and black and white striped paper at Hobby Lobby for twenty five cents a sheet. I used four sheets for this banner, that is approximately three feet long. I cut the pennants with my Cricut Explore Air 2 within minutes. However, if you do not have a Cricut Machine you can do what I did for many years and simply cut the triangles by hand. Make one to your desired size and use that to trace the rest. I then used a hole punch and thin rope I found in my husband's tool box to string this all together. Any kind of thin rope, twine, or yarn will work. 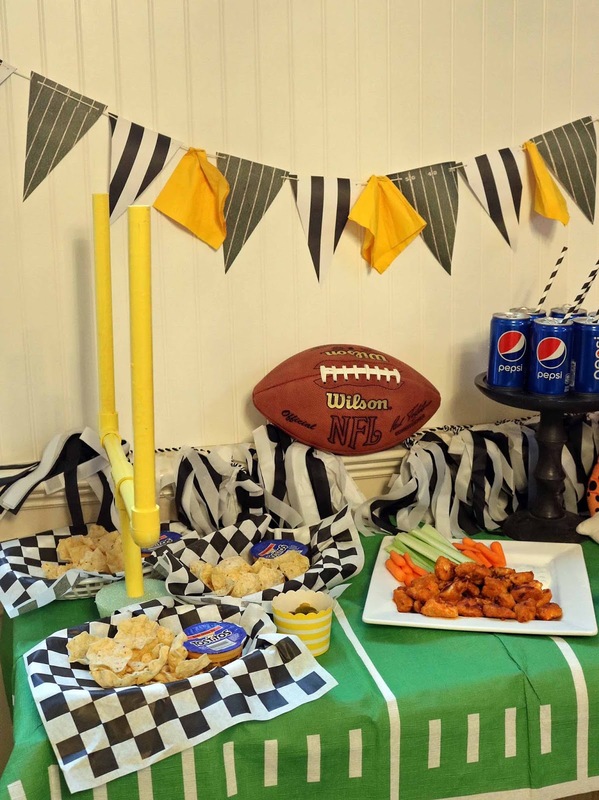 For the penalty flags I used yellow cocktail napkins. 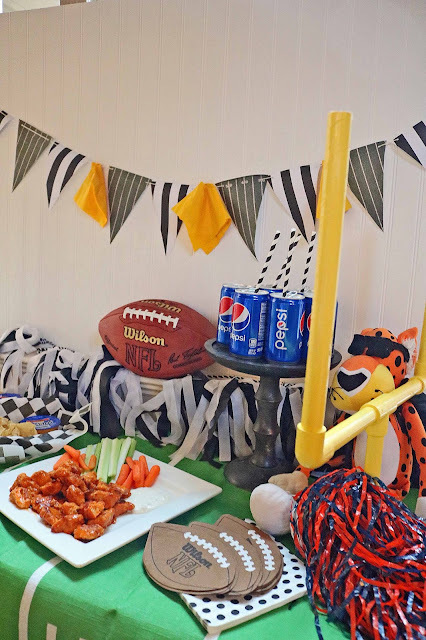 The goal posts were fun, cheap, and again easy to make! These will look great at any football party or tailgate in the future. I got the idea from WISE DIY. After a quick trip to Home Depot and a yellow spray paint session, they were complete. I also used green floral foam from the Dollar Tree to hold the posts up. Next, and maybe most important, the food. For our party we have a mix of salty and spicy. 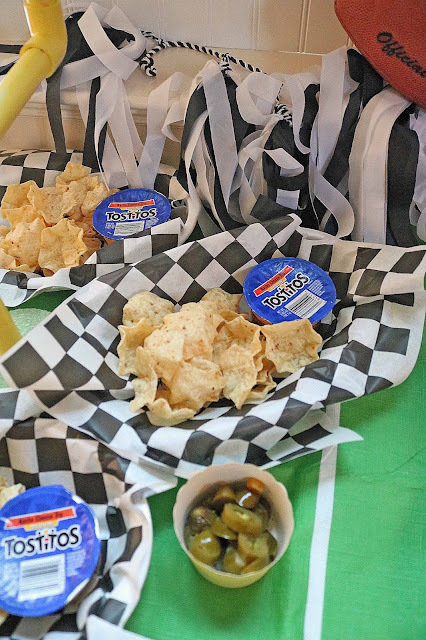 A nacho bar is always easy and a fan favorite with kids and adults. Tostitos Scoops accompanied by an individual serving of Tostitos Nacho Cheese Dip is a great game day snack. Salsa, guacamole, jalapenos, onion, tomatoes, olives, peppercinis, and green onion are other toppings you can set out at your nacho bar. And for convenience, you can order the Tostitos products right off Amazon and have them shipped to your doorstep! The most popular game day snack in this house are my baked boneless chicken wings. These are a healthy version of wings. You can also turn down or up the spice level depending on your crowd. Add some crisp celery and carrots, then serve with blue cheese or ranch dressing. I shared these on the blog last month, you can get the recipe here. To add a little extra fun to your party.You can print these free Super Bowl Bingo Cards or these from Here Comes The Sun. And lastly, another fun addition, or something to keep the kids occupied, is to throw around these inflatable footballs from Amazon. Note inflatable so they hopefully won't break anything!